Ariete seals are O.E.M equipment on many bikes and Ariete is one of the leading manufactures of rubber products for motorcycles. 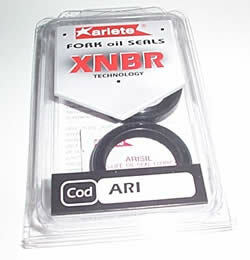 Ariete seals are made from XNBR. Each oil seal undergoes a final grinding operation and is individually tested to guarantee it's efficiency. Special seal grease is provided for the inner surface to ensure reduced stiction, improved ride quality and longer seal life.